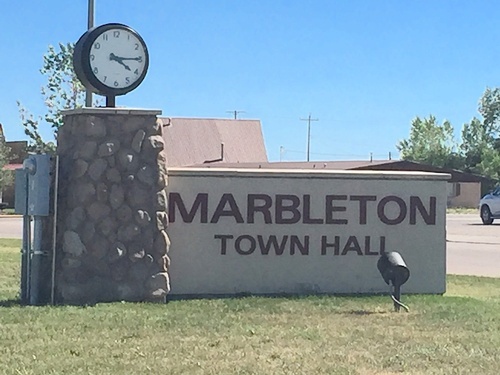 Welcome to the Town of Marbleton. It's a curiosity, considering most Wyoming towns are few and far between, that Big Piney and Marbleton would only be a mile apart. They have separate post offices and town governments. Big Piney was incorporated on July 5, 1913. In the early days there was a lot of drainage problems with the site on which Big Piney was built. So Charles Budd, eldest son to Dan B Budd had hope to build the town up on the bench to alleviate this problem. Charles did establish Marbleton on the bench, in late 1913, but it never replaced Big Piney. Any attempts to combine the two towns has been unsuccessful. The truth is people here kinda' like it that way. Both towns cooperate with each other, they have a common school. The citizens of these two towns take a lot of pride in the growth of their little metropolis over the past years and think the founders would be proud too. Both communities have thrived in the last several decades because of the oil and gas industry.